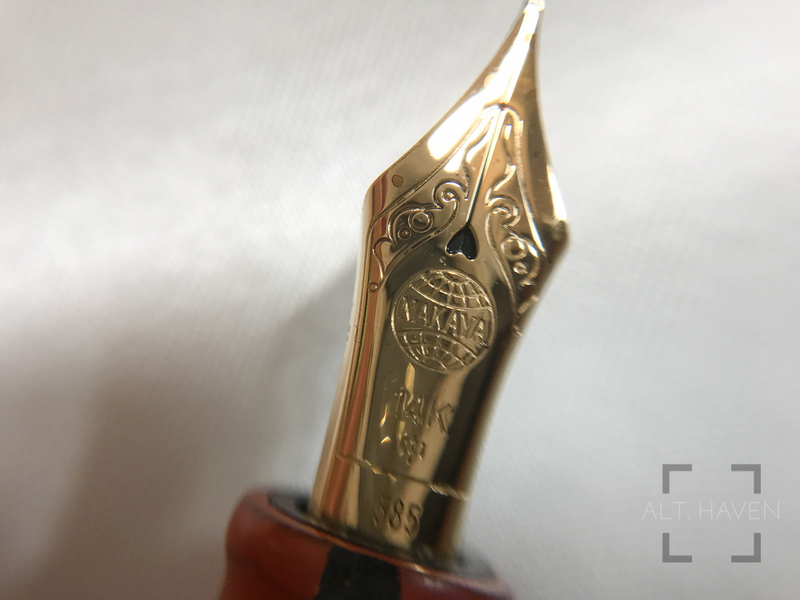 So, I won't lie and say this Nakaya is everything I dream about. This is my 3rd Nakaya. I placed an order for this pen way back in December 2016. I received pen in roughly late May 2017. Don't quote me on that, I am not quite sure of the timeline. Regardless it is safe to assume I waited about 6 months for the Nakaya. Not new. 6 months is a standard waiting time for a Nakaya. I ordered the Nakaya Negoro style "Nuno kise Hon Kataji" Arai-shu version. It is a long name so henceforth you will see me refer to this pen as the Nakaya Negoro. Let's cover the standards first. The Nakaya pen comes in the standard Nakaya wooden box with the pen kimono. Included is a Platinum converter as well as a box of either blue black or black cartridges. The Nakaya Negoro is a piccolo length. However it's girth is just slightly wider than the regular tamenuri models. I suspect this is due to the finish. See, the Negoro style is a standard piccolo but the artist would deliberately exposes the base. In a way you are buying a pre-crack pen. In a way it is a distortion of the concept of wabi-sabi since I am receiving the pen already imperfect. 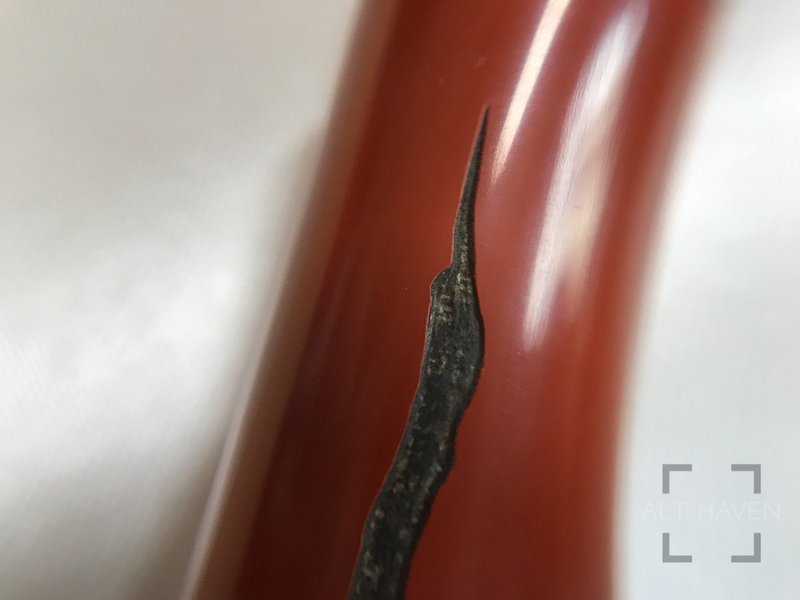 The “cracks” put into the finish will likely be different from pen to pen. This is the black base, red exterior finish while there is a red base, black exterior. I refer this version. It looks less like the cracks of hell opening up in my pen. 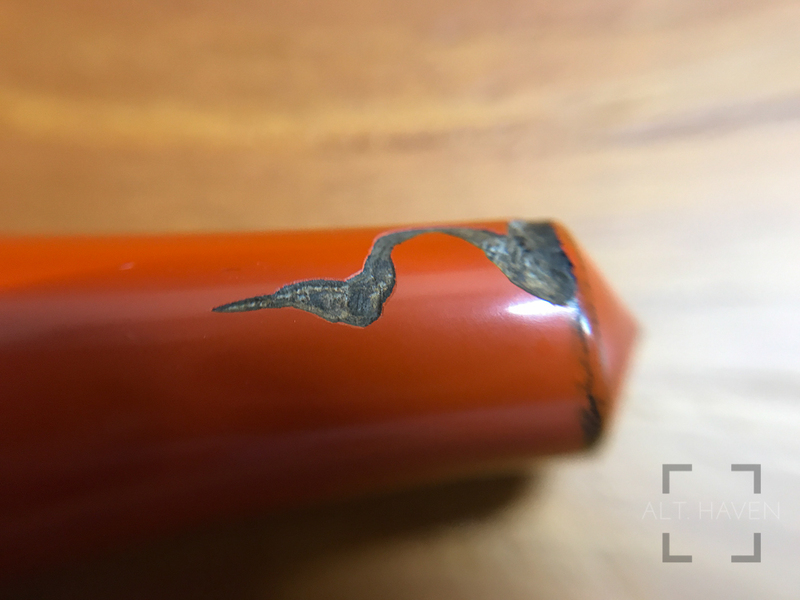 Comparing the photos on Nakaya's site and my pen, it seem it is standard to have one crack spanning the cap and the barrel, at the end of the barrel and one other crack on the opposite side of the longer crack. Inside, once uncapped, you will find similar treatment on the grip section. 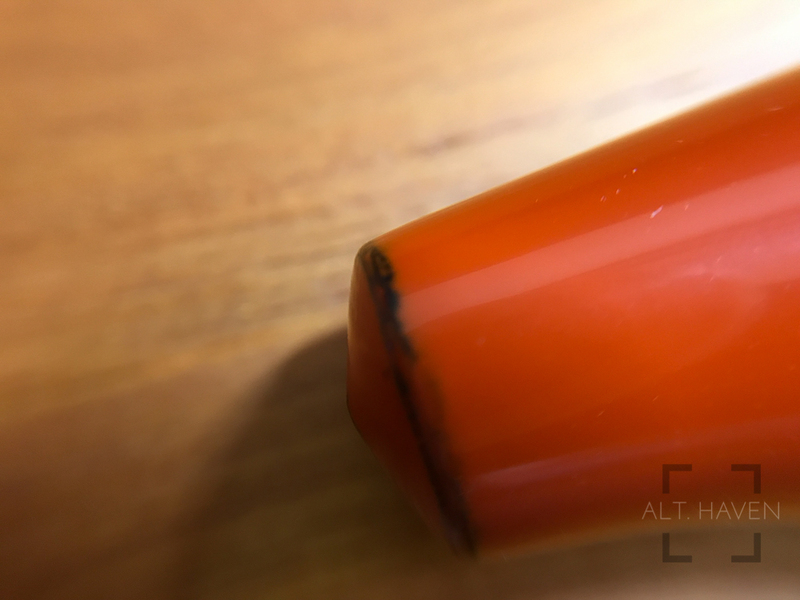 Due to the cracks that needed to be added to the pen, the urushi is probably slightly thicker than usual. My regular Piccolo models fit the Dudek Block in the larger holes (5/8”) but the Nakaya Negoro couldn't fit the same the others did. It doesn't go all the way down. Like the other Nakaya fountain pens I've reviewed, this is a cartridge and converter pen. It fits the regular Platinum converter and cartridges. That's standard for Nakaya pens after all you are buying the workmanship on the pens not the filling system. The balance is similar to the other Piccolo model I've reviewed so there is nothing new I want to add. For this particular Nakaya, I opted for a regular M nib. I already have the SF and SM so I didn't want to get the same nib again. The M nib writes well if a little boring but it is after all a medium nib. It is kind of meant to be boring. I guess. Here comes the problem. I was always under the impression that the Nakaya Negoro has a matte finish. This is entirely based on the picture found on Nakaya's website. I realised this is my mistake for not doing my research more carefully. Regardless, I am still disappointed. After all this isn't a cheap pen. Let this be a lesson to me and you to research a pen properly before buying. Pictures you see on one site may look one way but the same pen might look different under different lighting conditions. Overall, I am not entirely satisfied with the pen. In large part due to the difference in expectation and reality. This I accept as wholly my own fault. The M nib I choose didn't help matters. I do enjoy writing with it. It works very well for me. It is just a little meh, if you get what I mean. My intention is to get the nib grind to something more interesting when the Nakaya nibmeister next comes to Singapore.